$1500 deposit. 47 monthly repayments of $885. 60,000 KM allowance and a final payment of $33055 to keep your Toyota. $1500 deposit. 47 monthly repayments of $995. 60,000 KM allowance and a final payment of $35857 to keep your Toyota. $1500 deposit. 47 monthly repayments of $1083. 60,000 KM allowance and a final payment of $35857 to keep your Toyota. $1500 deposit. 47 monthly repayments of $1097. 60,000 KM allowance and a final payment of $35857 to keep your Toyota. [^A]Comparison Rates will vary for each customer between 6.64% and up to 16.76% (and annual percentage rates between 4.32% to 14.25%) depending primarily on your credit score and other relevant criteria determined by Toyota Finance. Comparison rates of 9.17% are available to around 70% of potential customers with a credit score of 600 and above, who also satisfy other relevant criteria determined by Toyota Finance. These figures are based on modelling by Toyota Finance. 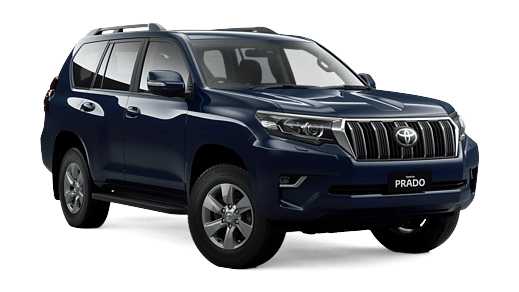 [†A] $254 per week are available on a Toyota Access Consumer Loan to approved personal applicants of Toyota Finance to finance the purchase of a Toyota Prado GXL Turbo-diesel with Leather Accented seats (Crystal Pearl and Black Leather Accented) Automatic, 2.8L Diesel . Driveaway price of $72339 (includes 12 months registration, 12 months compulsory third party insurance, dealer delivery and stamp duty), less a deposit of $1500, with 47 monthly payments in arrears not exceeding $1097 and a balloon final payment (equal to the ‘GFV’) of $35857. Additional interest charges accrue whenever a balloon final payment option is selected. Based on an annual percentage rate of 6.81 %. Total amount payable $87417. Terms, conditions, fees and charges apply. Offer valid until 22/04/2019. Comparison Rate of 9.17% is based on a 5 year secured consumer fixed rate loan of $30,000. WARNING: This comparison rate is true only for the examples given and may not include all fees and charges. Different terms, fees or other loan amounts might result in a different comparison rate. Toyota Finance is a division of Toyota Finance Australia Limited ABN 48 002 435 181, AFSL and Australian Credit Licence 392536. The Guaranteed Future Value ('GFV') is the minimum value of your new or approved demonstrator Toyota at the end of your finance contract, as determined by Toyota Finance, subject to fair wear and tear conditions and agreed kilometres being met (up to 60000 km). Please speak with your dealer for more information. [^B]Comparison Rates will vary for each customer between 6.64% and up to 16.76% (and annual percentage rates between 4.32% to 14.25%) depending primarily on your credit score and other relevant criteria determined by Toyota Finance. Comparison rates of 9.17% are available to around 70% of potential customers with a credit score of 600 and above, who also satisfy other relevant criteria determined by Toyota Finance. These figures are based on modelling by Toyota Finance. [†B] $230 per week are available on a Toyota Access Consumer Loan to approved personal applicants of Toyota Finance to finance the purchase of a Toyota Prado GXL Turbo-diesel (Silver Pearl and Grey (fabric)) Automatic, 2.8L Diesel . Driveaway price of $68147 (includes 12 months registration, 12 months compulsory third party insurance, dealer delivery and stamp duty), less a deposit of $1500, with 47 monthly payments in arrears not exceeding $995 and a balloon final payment (equal to the ‘GFV’) of $35857. Additional interest charges accrue whenever a balloon final payment option is selected. Based on an annual percentage rate of 6.81 %. Total amount payable $82623. Terms, conditions, fees and charges apply. Offer valid until 22/04/2019. Comparison Rate of 9.17% is based on a 5 year secured consumer fixed rate loan of $30,000. WARNING: This comparison rate is true only for the examples given and may not include all fees and charges. Different terms, fees or other loan amounts might result in a different comparison rate. Toyota Finance is a division of Toyota Finance Australia Limited ABN 48 002 435 181, AFSL and Australian Credit Licence 392536. The Guaranteed Future Value ('GFV') is the minimum value of your new or approved demonstrator Toyota at the end of your finance contract, as determined by Toyota Finance, subject to fair wear and tear conditions and agreed kilometres being met (up to 60000 km). Please speak with your dealer for more information. [^C]Comparison Rates will vary for each customer between 6.64% and up to 16.76% (and annual percentage rates between 4.32% to 14.25%) depending primarily on your credit score and other relevant criteria determined by Toyota Finance. Comparison rates of 9.17% are available to around 70% of potential customers with a credit score of 600 and above, who also satisfy other relevant criteria determined by Toyota Finance. These figures are based on modelling by Toyota Finance. 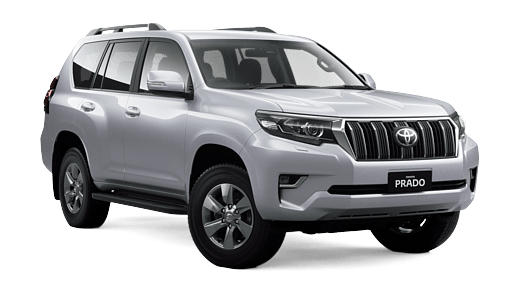 [†C] $230 per week are available on a Toyota Access Consumer Loan to approved personal applicants of Toyota Finance to finance the purchase of a Toyota Prado GXL Turbo-diesel (Crystal Pearl and Grey (fabric)) Automatic, 2.8L Diesel . Driveaway price of $68040 (includes 12 months registration, 12 months compulsory third party insurance, dealer delivery and stamp duty), less a deposit of $1500, with 47 monthly payments in arrears not exceeding $993 and a balloon final payment (equal to the ‘GFV’) of $35857. Additional interest charges accrue whenever a balloon final payment option is selected. Based on an annual percentage rate of 6.81 %. Total amount payable $82529. Terms, conditions, fees and charges apply. Offer valid until 22/04/2019. Comparison Rate of 9.17% is based on a 5 year secured consumer fixed rate loan of $30,000. WARNING: This comparison rate is true only for the examples given and may not include all fees and charges. Different terms, fees or other loan amounts might result in a different comparison rate. Toyota Finance is a division of Toyota Finance Australia Limited ABN 48 002 435 181, AFSL and Australian Credit Licence 392536. The Guaranteed Future Value ('GFV') is the minimum value of your new or approved demonstrator Toyota at the end of your finance contract, as determined by Toyota Finance, subject to fair wear and tear conditions and agreed kilometres being met (up to 60000 km). Please speak with your dealer for more information. [^D]Comparison Rates will vary for each customer between 6.64% and up to 16.76% (and annual percentage rates between 4.32% to 14.25%) depending primarily on your credit score and other relevant criteria determined by Toyota Finance. Comparison rates of 9.17% are available to around 70% of potential customers with a credit score of 600 and above, who also satisfy other relevant criteria determined by Toyota Finance. These figures are based on modelling by Toyota Finance. 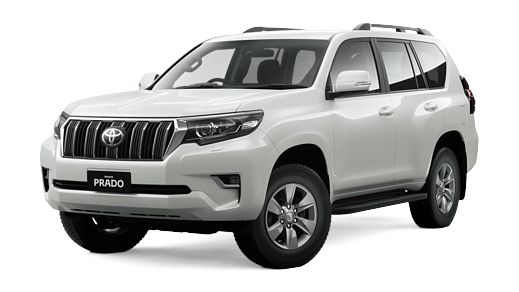 [†D] $205 per week are available on a Toyota Access Consumer Loan to approved personal applicants of Toyota Finance to finance the purchase of a Toyota Prado GXL Turbo-diesel (Crystal Pearl and Grey (fabric)) Automatic, 2.8L Diesel . Driveaway price of $61490 (includes 12 months registration, 12 months compulsory third party insurance, dealer delivery and stamp duty), less a deposit of $1500, with 47 monthly payments in arrears not exceeding $885 and a balloon final payment (equal to the ‘GFV’) of $33055. Additional interest charges accrue whenever a balloon final payment option is selected. Based on an annual percentage rate of 6.81 %. Total amount payable $74651. Terms, conditions, fees and charges apply. Offer valid until 22/04/2019. Comparison Rate of 9.17% is based on a 5 year secured consumer fixed rate loan of $30,000. WARNING: This comparison rate is true only for the examples given and may not include all fees and charges. Different terms, fees or other loan amounts might result in a different comparison rate. Toyota Finance is a division of Toyota Finance Australia Limited ABN 48 002 435 181, AFSL and Australian Credit Licence 392536. The Guaranteed Future Value ('GFV') is the minimum value of your new or approved demonstrator Toyota at the end of your finance contract, as determined by Toyota Finance, subject to fair wear and tear conditions and agreed kilometres being met (up to 60000 km). Please speak with your dealer for more information. [^E]Comparison Rates will vary for each customer between 6.64% and up to 16.76% (and annual percentage rates between 4.32% to 14.25%) depending primarily on your credit score and other relevant criteria determined by Toyota Finance. Comparison rates of 9.17% are available to around 70% of potential customers with a credit score of 600 and above, who also satisfy other relevant criteria determined by Toyota Finance. These figures are based on modelling by Toyota Finance. [†E] $205 per week are available on a Toyota Access Consumer Loan to approved personal applicants of Toyota Finance to finance the purchase of a Toyota Prado GXL Turbo-diesel (Silver Pearl and Grey (fabric)) Automatic, 2.8L Diesel . Driveaway price of $61490 (includes 12 months registration, 12 months compulsory third party insurance, dealer delivery and stamp duty), less a deposit of $1500, with 47 monthly payments in arrears not exceeding $885 and a balloon final payment (equal to the ‘GFV’) of $33055. Additional interest charges accrue whenever a balloon final payment option is selected. Based on an annual percentage rate of 6.81 %. Total amount payable $74651. Terms, conditions, fees and charges apply. Offer valid until 22/04/2019. Comparison Rate of 9.17% is based on a 5 year secured consumer fixed rate loan of $30,000. WARNING: This comparison rate is true only for the examples given and may not include all fees and charges. Different terms, fees or other loan amounts might result in a different comparison rate. Toyota Finance is a division of Toyota Finance Australia Limited ABN 48 002 435 181, AFSL and Australian Credit Licence 392536. The Guaranteed Future Value ('GFV') is the minimum value of your new or approved demonstrator Toyota at the end of your finance contract, as determined by Toyota Finance, subject to fair wear and tear conditions and agreed kilometres being met (up to 60000 km). Please speak with your dealer for more information. [^P]Comparison Rates will vary for each customer between 6.64% and up to 16.76% (and annual percentage rates between 4.32% to 14.25%) depending primarily on your credit score and other relevant criteria determined by Toyota Finance. Comparison rates of 9.17% are available to around 70% of potential customers with a credit score of 600 and above, who also satisfy other relevant criteria determined by Toyota Finance. These figures are based on modelling by Toyota Finance. [†P] $254 per week are available on a Toyota Access Consumer Loan to approved personal applicants of Toyota Finance to finance the purchase of a Toyota Prado GXL Turbo-diesel with Leather Accented seats + Flat Tailgate (Graphite and Black Leather Accented) Automatic, 2.8L Diesel . Driveaway price of $72339 (includes 12 months registration, 12 months compulsory third party insurance, dealer delivery and stamp duty), less a deposit of $1500, with 47 monthly payments in arrears not exceeding $1097 and a balloon final payment (equal to the ‘GFV’) of $35857. Additional interest charges accrue whenever a balloon final payment option is selected. Based on an annual percentage rate of 6.81 %. Total amount payable $87417. Terms, conditions, fees and charges apply. Offer valid until 22/04/2019. Comparison Rate of 9.17% is based on a 5 year secured consumer fixed rate loan of $30,000. WARNING: This comparison rate is true only for the examples given and may not include all fees and charges. Different terms, fees or other loan amounts might result in a different comparison rate. Toyota Finance is a division of Toyota Finance Australia Limited ABN 48 002 435 181, AFSL and Australian Credit Licence 392536. The Guaranteed Future Value ('GFV') is the minimum value of your new or approved demonstrator Toyota at the end of your finance contract, as determined by Toyota Finance, subject to fair wear and tear conditions and agreed kilometres being met (up to 60000 km). Please speak with your dealer for more information. [^F]Comparison Rates will vary for each customer between 6.64% and up to 16.76% (and annual percentage rates between 4.32% to 14.25%) depending primarily on your credit score and other relevant criteria determined by Toyota Finance. Comparison rates of 9.17% are available to around 70% of potential customers with a credit score of 600 and above, who also satisfy other relevant criteria determined by Toyota Finance. These figures are based on modelling by Toyota Finance. [†F] $230 per week are available on a Toyota Access Consumer Loan to approved personal applicants of Toyota Finance to finance the purchase of a Toyota Prado GXL Turbo-diesel (Crystal Pearl and Grey (fabric)) Automatic, 2.8L Diesel . Driveaway price of $68147 (includes 12 months registration, 12 months compulsory third party insurance, dealer delivery and stamp duty), less a deposit of $1500, with 47 monthly payments in arrears not exceeding $995 and a balloon final payment (equal to the ‘GFV’) of $35857. Additional interest charges accrue whenever a balloon final payment option is selected. Based on an annual percentage rate of 6.81 %. Total amount payable $82623. Terms, conditions, fees and charges apply. Offer valid until 22/04/2019. Comparison Rate of 9.17% is based on a 5 year secured consumer fixed rate loan of $30,000. WARNING: This comparison rate is true only for the examples given and may not include all fees and charges. Different terms, fees or other loan amounts might result in a different comparison rate. Toyota Finance is a division of Toyota Finance Australia Limited ABN 48 002 435 181, AFSL and Australian Credit Licence 392536. The Guaranteed Future Value ('GFV') is the minimum value of your new or approved demonstrator Toyota at the end of your finance contract, as determined by Toyota Finance, subject to fair wear and tear conditions and agreed kilometres being met (up to 60000 km). Please speak with your dealer for more information. [^G]Comparison Rates will vary for each customer between 6.64% and up to 16.76% (and annual percentage rates between 4.32% to 14.25%) depending primarily on your credit score and other relevant criteria determined by Toyota Finance. Comparison rates of 9.17% are available to around 70% of potential customers with a credit score of 600 and above, who also satisfy other relevant criteria determined by Toyota Finance. These figures are based on modelling by Toyota Finance. [†G] $254 per week are available on a Toyota Access Consumer Loan to approved personal applicants of Toyota Finance to finance the purchase of a Toyota Prado GXL Turbo-diesel with Leather Accented seats (Silver Pearl and Black Leather Accented) Automatic, 2.8L Diesel . Driveaway price of $72339 (includes 12 months registration, 12 months compulsory third party insurance, dealer delivery and stamp duty), less a deposit of $1500, with 47 monthly payments in arrears not exceeding $1097 and a balloon final payment (equal to the ‘GFV’) of $35857. Additional interest charges accrue whenever a balloon final payment option is selected. Based on an annual percentage rate of 6.81 %. Total amount payable $87417. Terms, conditions, fees and charges apply. Offer valid until 22/04/2019. Comparison Rate of 9.17% is based on a 5 year secured consumer fixed rate loan of $30,000. WARNING: This comparison rate is true only for the examples given and may not include all fees and charges. Different terms, fees or other loan amounts might result in a different comparison rate. Toyota Finance is a division of Toyota Finance Australia Limited ABN 48 002 435 181, AFSL and Australian Credit Licence 392536. The Guaranteed Future Value ('GFV') is the minimum value of your new or approved demonstrator Toyota at the end of your finance contract, as determined by Toyota Finance, subject to fair wear and tear conditions and agreed kilometres being met (up to 60000 km). Please speak with your dealer for more information. [^H]Comparison Rates will vary for each customer between 6.64% and up to 16.76% (and annual percentage rates between 4.32% to 14.25%) depending primarily on your credit score and other relevant criteria determined by Toyota Finance. Comparison rates of 9.17% are available to around 70% of potential customers with a credit score of 600 and above, who also satisfy other relevant criteria determined by Toyota Finance. These figures are based on modelling by Toyota Finance. [†H] $254 per week are available on a Toyota Access Consumer Loan to approved personal applicants of Toyota Finance to finance the purchase of a Toyota Prado GXL Turbo-diesel with Leather Accented seats (Peacock Black and Black Leather Accented) Automatic, 2.8L Diesel . Driveaway price of $72339 (includes 12 months registration, 12 months compulsory third party insurance, dealer delivery and stamp duty), less a deposit of $1500, with 47 monthly payments in arrears not exceeding $1097 and a balloon final payment (equal to the ‘GFV’) of $35857. Additional interest charges accrue whenever a balloon final payment option is selected. Based on an annual percentage rate of 6.81 %. Total amount payable $87417. Terms, conditions, fees and charges apply. Offer valid until 22/04/2019. Comparison Rate of 9.17% is based on a 5 year secured consumer fixed rate loan of $30,000. WARNING: This comparison rate is true only for the examples given and may not include all fees and charges. Different terms, fees or other loan amounts might result in a different comparison rate. Toyota Finance is a division of Toyota Finance Australia Limited ABN 48 002 435 181, AFSL and Australian Credit Licence 392536. The Guaranteed Future Value ('GFV') is the minimum value of your new or approved demonstrator Toyota at the end of your finance contract, as determined by Toyota Finance, subject to fair wear and tear conditions and agreed kilometres being met (up to 60000 km). Please speak with your dealer for more information. [^I]Comparison Rates will vary for each customer between 6.64% and up to 16.76% (and annual percentage rates between 4.32% to 14.25%) depending primarily on your credit score and other relevant criteria determined by Toyota Finance. Comparison rates of 9.17% are available to around 70% of potential customers with a credit score of 600 and above, who also satisfy other relevant criteria determined by Toyota Finance. These figures are based on modelling by Toyota Finance. [†I] $254 per week are available on a Toyota Access Consumer Loan to approved personal applicants of Toyota Finance to finance the purchase of a Toyota Prado GXL Turbo-diesel with Leather Accented seats (Graphite and Black Leather Accented) Automatic, 2.8L Diesel . Driveaway price of $72339 (includes 12 months registration, 12 months compulsory third party insurance, dealer delivery and stamp duty), less a deposit of $1500, with 47 monthly payments in arrears not exceeding $1097 and a balloon final payment (equal to the ‘GFV’) of $35857. Additional interest charges accrue whenever a balloon final payment option is selected. Based on an annual percentage rate of 6.81 %. Total amount payable $87417. Terms, conditions, fees and charges apply. Offer valid until 22/04/2019. Comparison Rate of 9.17% is based on a 5 year secured consumer fixed rate loan of $30,000. WARNING: This comparison rate is true only for the examples given and may not include all fees and charges. Different terms, fees or other loan amounts might result in a different comparison rate. Toyota Finance is a division of Toyota Finance Australia Limited ABN 48 002 435 181, AFSL and Australian Credit Licence 392536. The Guaranteed Future Value ('GFV') is the minimum value of your new or approved demonstrator Toyota at the end of your finance contract, as determined by Toyota Finance, subject to fair wear and tear conditions and agreed kilometres being met (up to 60000 km). Please speak with your dealer for more information. [^J]Comparison Rates will vary for each customer between 6.64% and up to 16.76% (and annual percentage rates between 4.32% to 14.25%) depending primarily on your credit score and other relevant criteria determined by Toyota Finance. Comparison rates of 9.17% are available to around 70% of potential customers with a credit score of 600 and above, who also satisfy other relevant criteria determined by Toyota Finance. These figures are based on modelling by Toyota Finance. 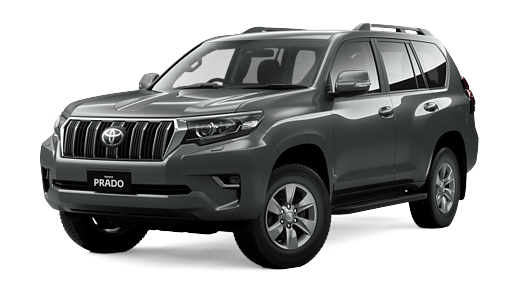 [†J] $230 per week are available on a Toyota Access Consumer Loan to approved personal applicants of Toyota Finance to finance the purchase of a Toyota Prado GXL Turbo-diesel with Flat Tailgate (Graphite and Grey (fabric)) Automatic, 2.8L Diesel . Driveaway price of $68147 (includes 12 months registration, 12 months compulsory third party insurance, dealer delivery and stamp duty), less a deposit of $1500, with 47 monthly payments in arrears not exceeding $995 and a balloon final payment (equal to the ‘GFV’) of $35857. Additional interest charges accrue whenever a balloon final payment option is selected. Based on an annual percentage rate of 6.81 %. Total amount payable $82623. Terms, conditions, fees and charges apply. Offer valid until 22/04/2019. Comparison Rate of 9.17% is based on a 5 year secured consumer fixed rate loan of $30,000. WARNING: This comparison rate is true only for the examples given and may not include all fees and charges. Different terms, fees or other loan amounts might result in a different comparison rate. Toyota Finance is a division of Toyota Finance Australia Limited ABN 48 002 435 181, AFSL and Australian Credit Licence 392536. The Guaranteed Future Value ('GFV') is the minimum value of your new or approved demonstrator Toyota at the end of your finance contract, as determined by Toyota Finance, subject to fair wear and tear conditions and agreed kilometres being met (up to 60000 km). Please speak with your dealer for more information. [^K]Comparison Rates will vary for each customer between 6.64% and up to 16.76% (and annual percentage rates between 4.32% to 14.25%) depending primarily on your credit score and other relevant criteria determined by Toyota Finance. Comparison rates of 9.17% are available to around 70% of potential customers with a credit score of 600 and above, who also satisfy other relevant criteria determined by Toyota Finance. These figures are based on modelling by Toyota Finance. [†K] $230 per week are available on a Toyota Access Consumer Loan to approved personal applicants of Toyota Finance to finance the purchase of a Toyota Prado GXL Turbo-diesel (Graphite and Grey (fabric)) Automatic, 2.8L Diesel . Driveaway price of $68147 (includes 12 months registration, 12 months compulsory third party insurance, dealer delivery and stamp duty), less a deposit of $1500, with 47 monthly payments in arrears not exceeding $995 and a balloon final payment (equal to the ‘GFV’) of $35857. Additional interest charges accrue whenever a balloon final payment option is selected. Based on an annual percentage rate of 6.81 %. Total amount payable $82623. Terms, conditions, fees and charges apply. Offer valid until 22/04/2019. Comparison Rate of 9.17% is based on a 5 year secured consumer fixed rate loan of $30,000. WARNING: This comparison rate is true only for the examples given and may not include all fees and charges. Different terms, fees or other loan amounts might result in a different comparison rate. Toyota Finance is a division of Toyota Finance Australia Limited ABN 48 002 435 181, AFSL and Australian Credit Licence 392536. The Guaranteed Future Value ('GFV') is the minimum value of your new or approved demonstrator Toyota at the end of your finance contract, as determined by Toyota Finance, subject to fair wear and tear conditions and agreed kilometres being met (up to 60000 km). Please speak with your dealer for more information. [^L]Comparison Rates will vary for each customer between 6.64% and up to 16.76% (and annual percentage rates between 4.32% to 14.25%) depending primarily on your credit score and other relevant criteria determined by Toyota Finance. Comparison rates of 9.17% are available to around 70% of potential customers with a credit score of 600 and above, who also satisfy other relevant criteria determined by Toyota Finance. These figures are based on modelling by Toyota Finance. 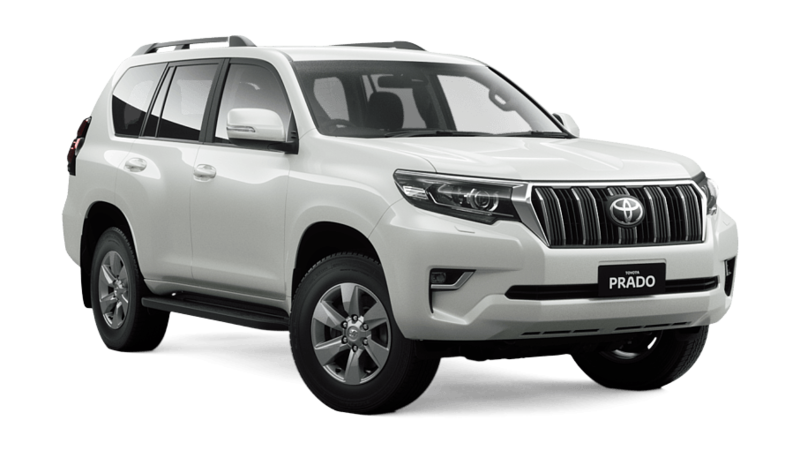 [†L] $251 per week are available on a Toyota Access Consumer Loan to approved personal applicants of Toyota Finance to finance the purchase of a Toyota Prado GXL Turbo-diesel with Leather Accented seats (Glacier White and Black Leather Accented) Automatic, 2.8L Diesel . Driveaway price of $71771 (includes 12 months registration, 12 months compulsory third party insurance, dealer delivery and stamp duty), less a deposit of $1500, with 47 monthly payments in arrears not exceeding $1083 and a balloon final payment (equal to the ‘GFV’) of $35857. Additional interest charges accrue whenever a balloon final payment option is selected. Based on an annual percentage rate of 6.81 %. Total amount payable $86759. Terms, conditions, fees and charges apply. Offer valid until 22/04/2019. Comparison Rate of 9.17% is based on a 5 year secured consumer fixed rate loan of $30,000. WARNING: This comparison rate is true only for the examples given and may not include all fees and charges. Different terms, fees or other loan amounts might result in a different comparison rate. Toyota Finance is a division of Toyota Finance Australia Limited ABN 48 002 435 181, AFSL and Australian Credit Licence 392536. The Guaranteed Future Value ('GFV') is the minimum value of your new or approved demonstrator Toyota at the end of your finance contract, as determined by Toyota Finance, subject to fair wear and tear conditions and agreed kilometres being met (up to 60000 km). Please speak with your dealer for more information. [^M]Comparison Rates will vary for each customer between 6.64% and up to 16.76% (and annual percentage rates between 4.32% to 14.25%) depending primarily on your credit score and other relevant criteria determined by Toyota Finance. Comparison rates of 9.17% are available to around 70% of potential customers with a credit score of 600 and above, who also satisfy other relevant criteria determined by Toyota Finance. These figures are based on modelling by Toyota Finance. [†M] $254 per week are available on a Toyota Access Consumer Loan to approved personal applicants of Toyota Finance to finance the purchase of a Toyota Prado GXL Turbo-diesel with Leather Accented seats + Flat Tailgate (Crystal Pearl and Black Leather Accented) Automatic, 2.8L Diesel . Driveaway price of $72339 (includes 12 months registration, 12 months compulsory third party insurance, dealer delivery and stamp duty), less a deposit of $1500, with 47 monthly payments in arrears not exceeding $1097 and a balloon final payment (equal to the ‘GFV’) of $35857. Additional interest charges accrue whenever a balloon final payment option is selected. Based on an annual percentage rate of 6.81 %. Total amount payable $87417. Terms, conditions, fees and charges apply. Offer valid until 22/04/2019. Comparison Rate of 9.17% is based on a 5 year secured consumer fixed rate loan of $30,000. WARNING: This comparison rate is true only for the examples given and may not include all fees and charges. Different terms, fees or other loan amounts might result in a different comparison rate. Toyota Finance is a division of Toyota Finance Australia Limited ABN 48 002 435 181, AFSL and Australian Credit Licence 392536. The Guaranteed Future Value ('GFV') is the minimum value of your new or approved demonstrator Toyota at the end of your finance contract, as determined by Toyota Finance, subject to fair wear and tear conditions and agreed kilometres being met (up to 60000 km). Please speak with your dealer for more information. [^N]Comparison Rates will vary for each customer between 6.64% and up to 16.76% (and annual percentage rates between 4.32% to 14.25%) depending primarily on your credit score and other relevant criteria determined by Toyota Finance. Comparison rates of 9.17% are available to around 70% of potential customers with a credit score of 600 and above, who also satisfy other relevant criteria determined by Toyota Finance. These figures are based on modelling by Toyota Finance. [†N] $254 per week are available on a Toyota Access Consumer Loan to approved personal applicants of Toyota Finance to finance the purchase of a Toyota Prado GXL Turbo-diesel with Leather Accented seats + Flat Tailgate (Silver Pearl and Black Leather Accented) Automatic, 2.8L Diesel . Driveaway price of $72339 (includes 12 months registration, 12 months compulsory third party insurance, dealer delivery and stamp duty), less a deposit of $1500, with 47 monthly payments in arrears not exceeding $1097 and a balloon final payment (equal to the ‘GFV’) of $35857. Additional interest charges accrue whenever a balloon final payment option is selected. Based on an annual percentage rate of 6.81 %. Total amount payable $87417. Terms, conditions, fees and charges apply. Offer valid until 22/04/2019. Comparison Rate of 9.17% is based on a 5 year secured consumer fixed rate loan of $30,000. WARNING: This comparison rate is true only for the examples given and may not include all fees and charges. Different terms, fees or other loan amounts might result in a different comparison rate. Toyota Finance is a division of Toyota Finance Australia Limited ABN 48 002 435 181, AFSL and Australian Credit Licence 392536. The Guaranteed Future Value ('GFV') is the minimum value of your new or approved demonstrator Toyota at the end of your finance contract, as determined by Toyota Finance, subject to fair wear and tear conditions and agreed kilometres being met (up to 60000 km). Please speak with your dealer for more information. [^O]Comparison Rates will vary for each customer between 6.64% and up to 16.76% (and annual percentage rates between 4.32% to 14.25%) depending primarily on your credit score and other relevant criteria determined by Toyota Finance. Comparison rates of 9.17% are available to around 70% of potential customers with a credit score of 600 and above, who also satisfy other relevant criteria determined by Toyota Finance. These figures are based on modelling by Toyota Finance. [†O] $254 per week are available on a Toyota Access Consumer Loan to approved personal applicants of Toyota Finance to finance the purchase of a Toyota Prado GXL Turbo-diesel with Leather Accented seats (Eclipse Black and Black Leather Accented) Automatic, 2.8L Diesel . Driveaway price of $72339 (includes 12 months registration, 12 months compulsory third party insurance, dealer delivery and stamp duty), less a deposit of $1500, with 47 monthly payments in arrears not exceeding $1097 and a balloon final payment (equal to the ‘GFV’) of $35857. Additional interest charges accrue whenever a balloon final payment option is selected. Based on an annual percentage rate of 6.81 %. Total amount payable $87417. Terms, conditions, fees and charges apply. Offer valid until 22/04/2019. Comparison Rate of 9.17% is based on a 5 year secured consumer fixed rate loan of $30,000. WARNING: This comparison rate is true only for the examples given and may not include all fees and charges. Different terms, fees or other loan amounts might result in a different comparison rate. Toyota Finance is a division of Toyota Finance Australia Limited ABN 48 002 435 181, AFSL and Australian Credit Licence 392536. The Guaranteed Future Value ('GFV') is the minimum value of your new or approved demonstrator Toyota at the end of your finance contract, as determined by Toyota Finance, subject to fair wear and tear conditions and agreed kilometres being met (up to 60000 km). Please speak with your dealer for more information. [^Q]Comparison Rates will vary for each customer between 6.64% and up to 16.76% (and annual percentage rates between 4.32% to 14.25%) depending primarily on your credit score and other relevant criteria determined by Toyota Finance. Comparison rates of 9.17% are available to around 70% of potential customers with a credit score of 600 and above, who also satisfy other relevant criteria determined by Toyota Finance. These figures are based on modelling by Toyota Finance. [†Q] $254 per week are available on a Toyota Access Consumer Loan to approved personal applicants of Toyota Finance to finance the purchase of a Toyota Prado GXL Turbo-diesel with Leather Accented seats (Wildfire and Black Leather Accented) Automatic, 2.8L Diesel . Driveaway price of $72339 (includes 12 months registration, 12 months compulsory third party insurance, dealer delivery and stamp duty), less a deposit of $1500, with 47 monthly payments in arrears not exceeding $1097 and a balloon final payment (equal to the ‘GFV’) of $35857. Additional interest charges accrue whenever a balloon final payment option is selected. Based on an annual percentage rate of 6.81 %. Total amount payable $87417. Terms, conditions, fees and charges apply. Offer valid until 22/04/2019. Comparison Rate of 9.17% is based on a 5 year secured consumer fixed rate loan of $30,000. WARNING: This comparison rate is true only for the examples given and may not include all fees and charges. Different terms, fees or other loan amounts might result in a different comparison rate. Toyota Finance is a division of Toyota Finance Australia Limited ABN 48 002 435 181, AFSL and Australian Credit Licence 392536. The Guaranteed Future Value ('GFV') is the minimum value of your new or approved demonstrator Toyota at the end of your finance contract, as determined by Toyota Finance, subject to fair wear and tear conditions and agreed kilometres being met (up to 60000 km). Please speak with your dealer for more information.